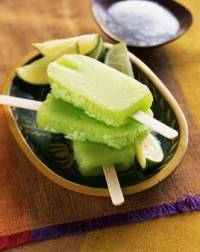 When your kids are craving a "cool" treat on a warm summer's day, give them these tasty and refreshing melon popsicles flavored with lime. They will love you for it! Popsicles can be made substituting cantaloupe, watermelon or other sweet melon of your choice instead of the honeydew, if desired. Pour mixture into molds and freeze until slushy, about 2 hours. Insert sticks, then freeze Popsicles until completely hardened, at least 6 hours. Popsicles can be made 2 days ahead (flavor diminishes if made any earlier). Makes 6 to 10 popsicles.